Lori asks Are You Suffering from Spiritual Affluenza? Lauren has 5 Ways to Find Balance as a SAHM. Lisa talks about If I Had Mothering to Do All Over Again. Nancy shares that a Harvard Study Finds Warm Moms Have Successful Sons. This past week, I undertook the mammoth task of moving photos from my phone to appropriate folders in Dropbox, then sending the ones I wanted to print to Snapfish. I hadn’t done this since last summer, so that was a lot of pictures!! Thought I’d share this one from a couple of months ago. 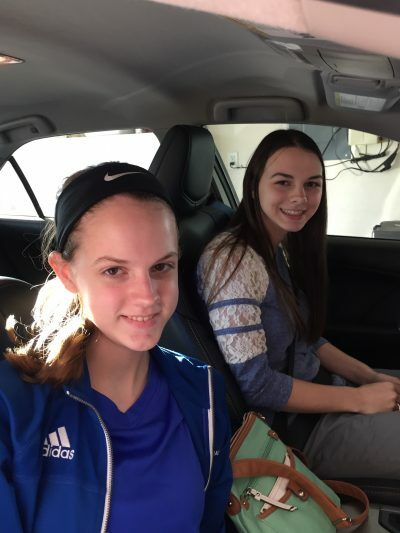 It was right before my 16-year-old took off driving without her dad or I in the passenger seat. I did a lot of praying that afternoon! I loved “Harvard Study Finds Warm Moms Have Successful Sons” – I strive for this! I am so monumentally behind on my pictures. I did so well digital scrapbooking for years, until my laptop crashed last fall. I’m going to have to force myself to catch up, b/c I know I’ll regret it if I don’t. Yes, going through all those pictures was definitely something I forced myself to do! 🙂 However, we’ve got a couple of family trips coming up in the next couple of months – and I know I’ll be taking lots of pictures then! – so I figured it would only get worse if I didn’t tackle it. You know how it is – it’s so overwhelming when you look at starting, but they you’re so glad it’s done once you’ve finished!! Oh, my goodness! Pictures! I have a couple of boxes of them, and I know I need to go through them, even if it’s just to get rid of the bad one and the duplicates. But I keep putting it off because it’s such a big job! So I’m so glad that you tackled yours! I loved the posts about warm mothers and doing mothering all over again. I enjoy hearing the perspective and experience of mothers with older children. And I really want to have a good, encouraging relationship with my son. I don’t care how much money he makes (as long as he can support his family :), but I do want him to be successful at what he chooses. I have to say that I’m glad I got the pictures project handled, for now anyway 🙂 As I mentioned to Sues, we’ve got a couple of family trips coming up in the next couple of months (lots of potential picture-taking there) so I figured it would only get worse if I didn’t tackle it. And even though my children are “older,” I still like hearing from moms who have parented teenagers and college-aged young people. I’m still learning so much about parenting through these stages!